Lipton Tomato Instant Soup, also called Lipton Tomato Cup-a-Soup, is a dry soup mix that comes in single-serve envelopes. It is made by simply adding hot water to the soup mix. It can also be cooked in the microwave. 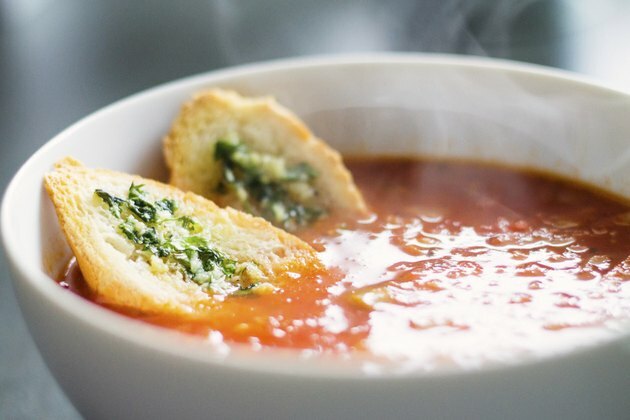 With zero calories from fat, no cholesterol and only 90 calories per serving, Lipton tomato soup makes a good warm snack or light meal choice. The main ingredient of Lipton Tomato Soup is milk product called whey. Whey is the liquid that is formed as a bi-product of cheese production. The powdered form of whey has the water removed from it. Whey is the source of protein in Lipton Tomato Soup, providing 2 g of protein per serving. The other milk product ingredient in Lipton Tomato Soup is cream. Another ingredient in Lipton Tomato Soup is tomato powder. Tomato powder is made from dehydrated tomatoes and gives the soup tomato flavor. It also enhances the color of and helps to thicken the tomato soup. Lipton tomato soup contains two natural spices -- onion powder and garlic powder -- that add to the flavor of the soup. Lipton Tomato Soup contains two flavor additives. The first is natural flavor. The ingredients of the natural flavor are not disclosed. On the Lipton Cup-a-Soup website, it is explained that these natural flavors are what makes the soup formula unique. The second flavor additive is autolyzed yeast extract. This product is an inactive yeast used often in processed foods to give the foods enhanced flavor. Lipton Tomato Soup contains a significant amount of salt. There are 520 mg of sodium in a single serving size of the soup, which represents 22 percent of the recommended daily value of sodium. Lipton Tomato Soup contains two different sugars. One is regular sugar, or glucose. The other is a food additive called maltodextrose. Maltodextrose is a type of sugar made from starch, typically from corn. It adds sweetness and also acts as a thickener. A single serving of the soup has 13 g of sugars. The main thickener of Lipton Tomato Soup is potato starch. This starch is a powder derived from potatoes. This gluten-free and Kosher starch is used as a thickener without adding significant flavor or fat. Paprika oleoresin is added to Lipton tomato soup to give the soup its distinctive red-orange color. This natural liquid extract comes from a plant called Capsium Annum linn, and is often used in tomato products. drugstore.com: "Lipton Cup-a-Soup, Tomato: Nutritional Facts"
savoryspiceship.com: "Herbs &amp; Spices: Tomato Powder"
The Cook's Thesaurus: "Starch Thickeners"